The Beach Walker makes going to the beach easy, from your front door to the water's edge. 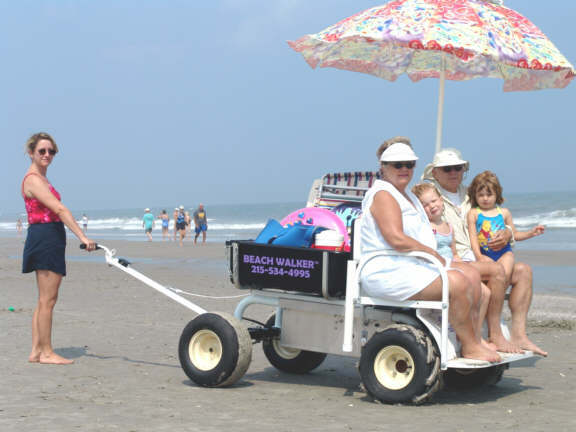 There is no strength or size requirements for the operator - any adult can easily operate the Beach Walker and can tow even the heaviest of loads. It is the Beach Walker that bears the weight of the load and the strength for the tow - it is if you were walking alone. Large cargo box for storage i.e. beach chairs, coolers, boogie boards, toys, beach tags, etc. Side mounted cylinders for housing removable beach umbrellas, fishing poles, fan, etc. 110VAC power outlet for plugging in various equipment i.e. refrigeration, radio, TV, fan, phone charger, laptop, blender, etc. 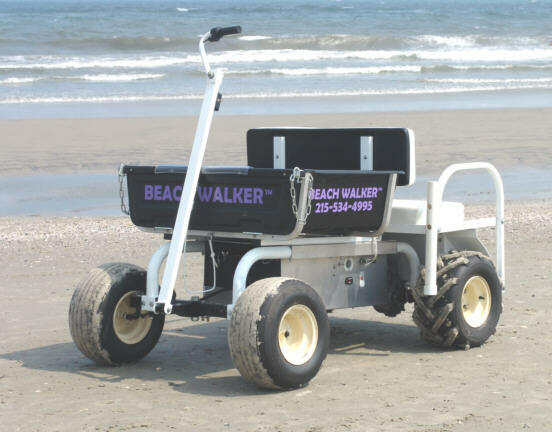 To operate The Beach Walker, simply load up your passengers, carge and turn the power switch ON, and turns the handle's built-in throttle until you've reached a comfortable walking speed. With the Beach Walker's 1.5 horse power, high-torque motor and balloon type tires, the Beach Walker makes moving from hard pavement surface to very soft sand effortless. The operator simply steers the handle in the direction desired, manipulates the handles throttle to give more or less motor to the motor depending on the surface or grade. The rear bench seat provides handicapped persons beach access, particularly elderly beach goers/homeowners with limited physical strength to carry themselves a distance across the sand. Surf-casting fisherman and hunters can effortlessly and efficiently cart gear and catch/kill. Replace the effort of the wheel barrel for use in landscaping, gardening, and construction.